What to eat during fasting (other than cranberries & coconut oil) is on my mind. Looking for some variation in the fasting menu. It’s a great question. We did have a post on one possible fasting food – Neo-Agutak: “Eskimo Ice Cream” – but never discussed alternatives or the reasons for eating particular foods during a fast. The law of fasting requires a Catholic from the 18th Birthday (Canon 97) to the 59th Birthday (i.e. the beginning of the 60th year, a year which will be completed on the 60th birthday) to reduce the amount of food eaten from normal. The Church defines this as one meal a day, and two smaller meals which if added together would not exceed the main meal in quantity. Such fasting is obligatory on Ash Wednesday and Good Friday. The fast is broken by eating between meals and by drinks which could be considered food (milk shakes, but not milk). Children, the elderly, and those whose health might be threatened are exempt from the requirement to fast. So let’s consider a fast to be any period of reduced calorie consumption – not zero food. It is certainly a mistake to consume nothing at all during a fast. People deprived of fluids and electrolytes die quickly. In a famous case cited in Wikipedia (“Starvation”), Drusus Caesar, son of Agrippina the Elder, was starved to death in 33 AD by the emperor Tiberius, and managed to stay alive for nine days only by chewing the stuffing of his bed. When Saint Maximilian Kolbe and nine others were starved in Auschwitz, seven of the ten died within two weeks. When fluids are provided, however, survival can be much longer. Even in his 60s, Gandhi was able to go without food for 21 days. In the Irish hunger strikes of 1980-1981, no one who fasted less than 46 days died, and about half those who fasted between 46 and 73 days died. Sodium and chlorine. During a fast protein is converted to glucose and ketones, releasing nitrogen waste in the form of urea. Sodium and chloride are excreted along with the urea. Salt loss can be fairly rapid during a fast, equivalent to as much as a teaspoon of salt a day. A large amount of water is lost along with it. Potassium. Potassium is the intracellular electrolyte, sodium the extracellular, and osmotic pressure must be balanced. So potassium will be lost along with water and sodium, and should be replenished with it. Calcium and magnesium. These also serve electrolytic functions and it is desirable to maintain their concentrations. Acids. These are beneficial for the digestive tract and metabolism, and also for solubilization of minerals. Citrate, for instance, helps prevent kidney and gallstones. 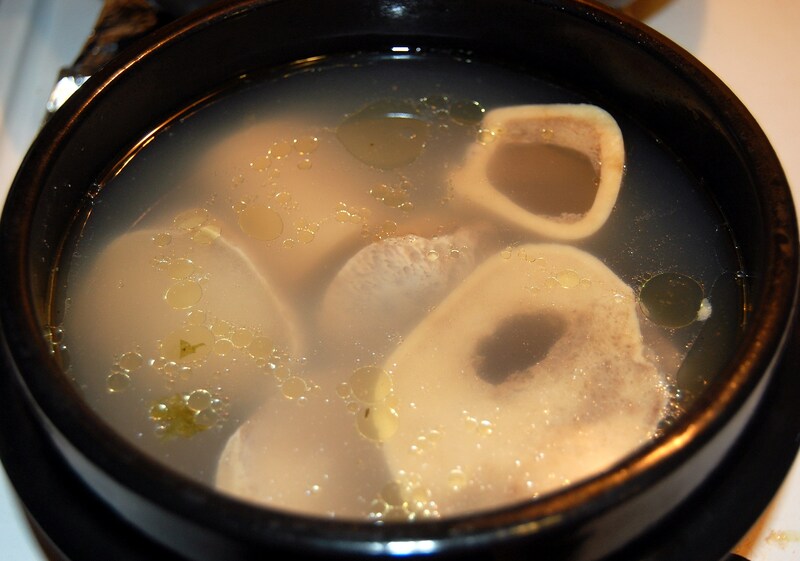 Vegetables are the best source of potassium; bone broth is a source of calcium and magnesium. The best acids are citrus juices, such as lemon juice, and vinegars, such as rice vinegar. Sea salt, or salty flavorings such as soy sauce or fish sauce, can provide sodium chloride. 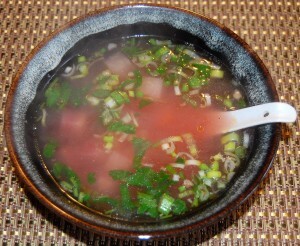 So the most basic food to take during a fast is a soup made of vegetables in bone broth, with salt and an acid added. It’s best to use a ceramic or enameled pot to prevent leaching of metals from the pot. Add salt, pepper, acid, and spices to taste. So far we haven’t provided any calories to speak of. The next step in reducing the stress of the fast is to add some nutrition to the soup. A protein-sparing modified fast. Protein, which is convertible to glucose, is eaten to relieve the carb+protein deficit. A ketogenic fast. Short-chain and medium-chain fatty acids, such as are found in coconut oil, are eaten to generate ketones. Ketones can partially substitute for glucose utilization. What these have in common is that they reduce the carb+protein. Probably 90% of people who fast should favor the protein-sparing approach. Those on ketogenic diets for neurological disorders should probably favor the ketogenic fasting approach. An example of a food suitable for a ketogenic fast would be Neo-Agutak: “Eskimo Ice Cream” (Dec 5, 2010). A suitable food on a protein-sparing modified fast would supply most calories as protein; carb and fat calories would be from nutrient-dense sources. Egg yolks, which are rich in phospholipids like choline, and potatoes are good examples of nutrient-dense fat and carb sources. The easy way to implement this healthy fast: just add eggs, potatoes, and maybe some fish or shellfish (which tend to be protein-rich, and comply with the Catholic guidelines for Friday abstinence) to any of the soups shown above. 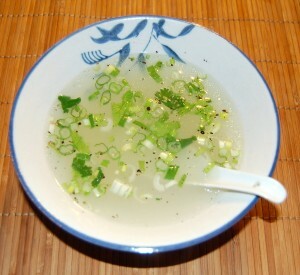 Heat the soup in the microwave and there you have it: a healthy fast-day meal! Those on weight loss diets will notice that by adding protein, carbs, and a few nourishing fats to our fast-day soup, we’re getting very close to our recommended diet for calorie-restricted weight loss diets: see Perfect Health Diet: Weight Loss Version (Feb 1, 2011). There’s a good reason for that: both posts work from the same design principles. Both aim at the greatest possible nourishment on the fewest calories. Would you like to lose weight? Consider making these nourishing soups a staple of your diet. Even if you’re not fasting or trying to lose weight, consider making these soups a regular part of your daily meals. 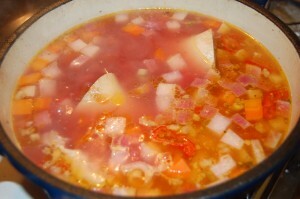 It’s very easy to make a broth on the weekend and warm it up and pour it over diced vegetables at mealtime. You might find them a very satisfying addition to your diet. A while back I noted that hypothyroidism is a circadian rhythm disorder and that dietary steps that restore circadian rhythms, like intermittent fasting and daytime eating, should be therapeutic (“Intermittent Fasting as a Therapy for Hypothyroidism,” Dec 1, 2010). Dyslipidemia, metabolic syndrome and obesity. Circadian rhythm disruption also suppresses immune function and increases vulnerability to infectious disease. Restoring or strengthening circadian rhythm may be therapeutic for all of these conditions. Even for healthy people, tactics for enhancing circadian rhythms may improve health. Which brings us to Seth Roberts. Seth is a well-known blogger, a Paleo dieter and psychologist, author of The Shangri-La Diet, and a great self-experimenter. Seth recently gave a talk that tells the history of his self-experimentation. It turns out he suffered from disturbed sleep for many years. He experimented to find cures for 10 years; nothing worked. But then he got a lead. When a student suggested he eat more fruit, he started eating fruit for breakfast. His sleep got worse! This was exciting to Seth because it was, in 10 years, the first thing he tried that changed his sleep. This directly supports our idea that intermittent fasting (confining eating to an 8-hour window each day) should be therapeutic for circadian rhythm disorders such as disturbed sleep and hypothyroidism. But what’s exciting is that Seth continued his experiments to find other ways to improve his sleep. As a psychologist, he knew that human contact controls when we sleep: people are most awake at the times they have contact with other people, and asleep when isolated. He knew that watching TV can have effects similar to socializing. So he tried watching Jay Leno one morning. He slept very well the next night. Another thing that relates to circadian rhythms is exercise: we normally exercise during the day and rest at night. For a scholar, the easiest way to exercise is to stand rather than sit (for instance, by working at a standing desk). 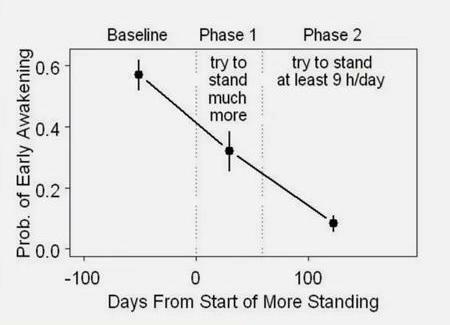 Seth tried standing 9 hours a day – and it cleared his sleep problem! Of course, standing is not a very strenuous exercise. Seth found that if he just stood on one leg, the effect was much more intense, and he could fix his sleep problem with only minutes of one-legged standing per day. 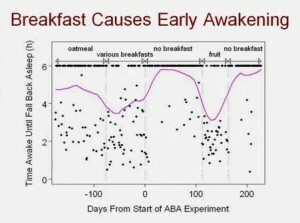 He also found that eating more animal food improved his sleep. 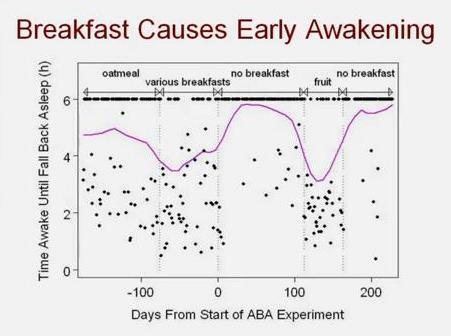 It’s possible that animal fat may enhance circadian rhythms more than other foods. I found this fascinating – because it adds more evidence regarding the centrality of circadian rhythms in health – and exciting, because it shows that simple tactics can be therapeutic for circadian rhythm disorders. Light entrainment: Get daytime sun exposure, and sleep in a totally darkened room. Daytime feeding: Eat during daylight hours, so that food rhythms and light rhythms are in synch. 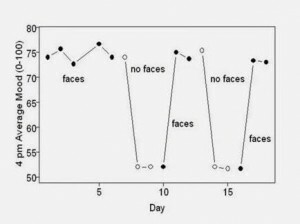 Intermittent fasting: Concentrate food intake during an 8-hour window during daylight hours, preferably the afternoon. A 16-hour fast leading to lower blood sugar and insulin levels, and the more intense hormonal response to food that results from concentration of daily calories into a short 8-hour time window, will accentuate the diurnal rhythm. Adequate carb intake: Eat at least 400 “safe starch” carbohydrate calories daily during the afternoon feeding window. Relative to a very low-carb diet, this will increase daytime insulin release and, by increasing insulin sensitivity, may reduce fasting insulin levels. It will thus enhance diurnal insulin rhythm. Looking at human faces: If you work at a computer, keep a window up that cycles among photos of faces, or shows a video of a talk show; keep photos of your family near your screen. Standing: Work at a standing desk or, failing that, get in the habit of standing on one leg rather than two. Animal fat: Eat a diet high in animal fats. These tactics cured Seth’s sleep disorder. Might these tactics also cure or greatly improve other circadian rhythm disorders – including hypothyroidism and psychiatric disorders like depression and bipolar disorder? Could looking at human faces help the obese lose weight and improve their lipid profiles? I don’t know but I’d certainly give these techniques a try before pharmaceutical drugs. I believe these techniques deserve clinical testing as therapies for all diseases associated with disrupted circadian rhythms. I believe that they may be just as beneficial for the healthy: by improving immune function, they may delay aging and extend lifespan. Perhaps that statement wasn’t as exaggerated as it may have seemed! Gunther gatherer raised an interesting issue in a comment to Tuesday’s post. Protein may be satiating in the short run; but what about the long run? [H]igh protein keeps you full at first. But no one really knows for how long. Eventually it stops working and you find you’re eating a lot ON TOP of all the high protein you were already eating. All of us here tried Atkins long ago and fell off the bandwagon more than enough times to know it gets boring, stops working against hunger and doesn’t keep the fat off forever. I agree. This is why we recommend a version of the normal Perfect Health Diet, which is normal — not high — in protein, for weight loss. Our diet isn’t the quickest way to lose weight, but we think it is likely to work best in the long run. I argued in Tuesday’s post that the satiating effects of protein had to be temporary, and that in the long run higher protein might cause, not reduced appetite, but only a slight change toward a leaner body composition. A more interesting question is: could high-protein diets be positively harmful? Maybe! Studies in both animals and humans indicate that eating high protein during childhood creates a predisposition for obesity in later life. So parents, let your kids follow their taste buds to high-carb, high-fat diets! Might adult high protein diets promote later-life obesity too? I’m not aware of evidence, but I don’t think the possibility can be ruled out. I will look for evidence when I do research for two future blog series: one on protein intake, aging, and longevity; the other on connections between obesity and the human aging program. Can You Be Lean on a Low-Protein Diet? Tuesday’s post cited research indicating that we have a set point for protein intake: humans are genetically programmed to seek around 360 protein calories per day, and appetite becomes satiated once that is achieved. If total calories are not increased, then the low protein dieter can expect to have a chronically unsatisfied appetite. If total calories are increased, so that appetite is satisfied, then the low protein dieter can expect a higher equilibrium weight and a slightly less lean body. Is it possible, then, to restrict protein, eat mostly carbs and fat which we know are the ingredients of appetizing desserts – and still achieve a lean healthy body, and feel comfortable? I think it would be a bit fairer to include some consideration and explanation of Melanesians and their extremely low protein diet (anywhere from 10% to only 3% protein daily). Their extremely high level fitness and body composition flies in the face of all of these high protein studies. It’s true: Kitavans, Tokelauans, and other Melanesians eat high-carb and low-protein, yet they’re noted for “extreme leanness.”  Why? Well, first of all, the Melanesian islander diet is a variant of the Perfect Health Diet: it is entirely free of food toxins. As I argued last week, eliminating toxins is the key to healthy weight regulation. But there are other factors. The most abundant fatty acid in the diets of Kitavans and Tokelauans is lauric acid, the 12-carbon fatty acid which is the predominant fatty acid in coconut oil. [4, 5] These shorter-chain fatty acids are ketogenic and have significant effects on the body: for instance, they raise HDL levels. They also make people lean. Another feature of the Melanesian diet is that the biggest share of calories came from “safe starches” like yams, sweet potatoes, and sago. These foods have a lot of fiber in the form of “resistant starch.” Digestion of resistant starch by colonic bacteria produces a lot of butyrate, a short-chain fatty acid that strongly promotes leanness. But the most reliable strategy seems to have been worked out by Asian and Pacific cultures long ago, many thousands of years ago. The key is that if the diet is well nourishing, then appetite will be mild and easy to consciously control. What will be experienced is not hunger, which indicates malnourishment, but a mild desire for food that can easily be ignored. 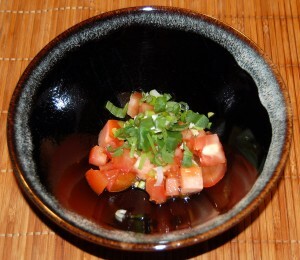 In Japanese the saying is Hara Hachi Bu, eat until eight-tenths full. 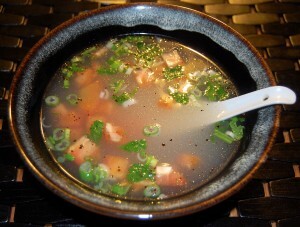 Hara Hachi Bu is common practice in Okinawa, where it helped produce the world’s most long-lived population. As we note in the book, the traditional Okinawan diet is extremely close to the Perfect Health Diet: the Okinawan diet was rich in safe starches and animal fats, and near the low end of our recommended protein range: Okinawans ate about 300 g (2/3 pound) meat and fish per day. The key here is that on a low-protein diet, eating until eight-tenths full is not a calorie-restricted diet. It is a calorie-sufficient diet that isn’t quite satiating because it is low in protein. 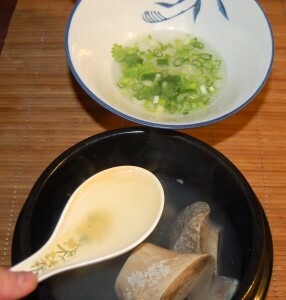 Intermittent fasting is a helpful part of Hara Hachi Bu. Eating only within a relatively short window each day makes it easy to keep calories down. I have been practicing protein restriction for several years, eating coconut oil and safe starches for several years, and practicing daily intermittent fasting for over six months. I drink tea or lemon-flavored water through the morning, and on most days eat only between 2 pm and 8 pm. If I snack during the fast it is usually either a piece of dark chocolate or some coconut oil. I sometimes go many days eating relatively little, then eat a lot for a few days. Physical activity – sports, intense exercise, running – increases my appetite noticeably. Regardless, I never feel hungry. It is easy to complete the daily fast: some tea, sometimes with coconut oil or dark chocolate, is enough. I now do total fasting on religious fast days – for instance, I now do a 64-hour fast from Holy Thursday through Easter Sunday morning. Generally, as soon as I focus my attention on work I forget that I wanted food. I haven’t noticed difficulty adding muscle when I work out. I believe I would add muscle more easily on a higher-protein diet, but as it is I add muscle more easily than I used to on the standard American diet. I’m content with my body composition. I am convinced that by eating coconut oil, getting carbs from safe starches, and practicing intermittent fasting and Hara Hachi Bu, most people can become well-muscled and lean on a low-protein diet without any sense of hardship. Since a carb-fat mix is the classic recipe for dessert, this makes for an extremely tasty diet. If you want the surest way to lose weight over the next few days, eat a high-protein diet. But if you want a long-term diet that maximizes longevity by restricting protein, consider eating a tablespoon or two of coconut oil per day, fasting for 16 hours a day, and finishing your meal eight-tenths full. If you walk a hundred steps after dinner, you just might become a healthy centenarian! Maurer AD et al. Consumption of diets high in prebiotic fiber or protein during growth influences the response to a high fat and sucrose diet in adulthood in rats. Nutr Metab (Lond). 2010 Sep 29;7:77. http://pmid.us/20920272. European Childhood Obesity Trial Study Group. Lower protein in infant formula is associated with lower weight up to age 2 y: a randomized clinical trial. Am J Clin Nutr. 2009 Jun;89(6):1836-45. http://pmid.us/19386747. Lindeberg S et al. Haemostatic variables in Pacific Islanders apparently free from stroke and ischaemic heart disease–the Kitava Study. Thromb Haemost. 1997 Jan;77(1):94-8. http://pmid.us/9031456. Lindeberg S et al. Lipoprotein composition and serum cholesterol ester fatty acids in nonwesternized Melanesians. Lipids. 1996 Feb;31(2):153-8. http://pmid.us/8835402. Lindeberg S, Vessby B. Fatty acid composition of cholesterol esters and serum tocopherols in Melanesians apparently free from cardiovascular disease – the Kitava study. Nutr Metab Cardiovasc Dis. 1995; 5: 45-53. Xue C et al. Consumption of medium- and long-chain triacylglycerols decreases body fat and blood triglyceride in Chinese hypertriglyceridemic subjects. Eur J Clin Nutr. 2009 Jul;63(7):879-86. http://pmid.us/19156155. Assunção ML et al. Effects of dietary coconut oil on the biochemical and anthropometric profiles of women presenting abdominal obesity. Lipids. 2009 Jul;44(7):593-601. http://pmid.us/19437058. Gao Z et al. Butyrate improves insulin sensitivity and increases energy expenditure in mice. Diabetes. 2009 Jul;58(7):1509-17. http://pmid.us/19366864. We’ve previously argued that people with migraines should try a ketogenic diet. There are two reasons: (1) ketones can evade certain mitochondrial defects which might cause migraines, and (2) ketones reduce glutamate levels, and glutamate toxicity is implicated in migraines. I fasted for 30 days. When I say “fast” I mean that I stopped eating all food. I consumed only water and occasionally sea salt and potassium tablets. As part of the fast I stopped taking Imitrex which I had been using almost daily to control my migraines. I did this because I thought Imitrex was increasing the number of migraines due to a rebound effect. I also stopped consuming caffeine to which I was addicted. As the fast went on, my migraines lasted for shorter periods of time, and they became less painful. By day 23 I became free of headaches. There was still some sort of migraine activity — I could often feel the sensations that in all my previous life, had always been followed by a headache — but no headache resulted. Judging from what I could feel, there is a cascade of events that leads to a migraine, and the metabolic changes induced by the fast were interrupting the cascade at a certain point. I was quite happy with this result and continued the fast as long as I could in the hopes that this would increase the chances that the change would be permanent. Unfortunately, after the fast ended, the headaches gradually came back. I think this happened because after the first few post-fast meals, I made no effort to keep my diet ketogenic. An intense craving for fruit developed and once the danger of refeeding syndrome seemed to be over, I gave in. This was interesting because before the fast I had been on low carb diets since 2007 and hadn’t craved carbs in years. When I saw the gains slipping away, I fasted again for two days to get back into ketosis as quickly as possible. Then I started following a diet similar to those used by neurologists at Johns Hopkins to treat children with epilepsy, with calorie restriction, frequent meals, and a ratio of fat to protein (by weight) of four to one. After two days of this diet, my headaches stopped again. That was only 48 hours ago but I’m sure the diet is working because I challenged myself last night with a sure-fire migraine trigger by staying up past my bedtime to watch the eclipse. Normally this would create a debilitating headache, but the only result was a slight migrainy feeling that was easily controlled with two aspirin. Before the fast, aspirin had no apparent effect on my migraines. The next step will be to try more moderate diets and find the least extreme one that controls the headaches. 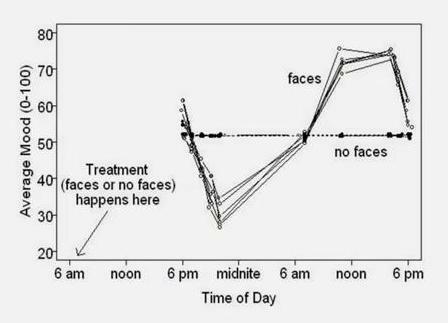 The fast proved that migraine headaches can be stopped by the metabolic changes induced by fasting. Hopefully I can find a way to make that same metabolic state occur permanently. Incidentally, the fast had some unexpected beneficial effects. A bad varicose vein is dramatically improved, and a teary eye problem (which I think was caused by a clogged tear duct, and which I previously controlled with large amounts of vitamin C) has resolved almost completely. I think this kind of experimentation is extremely important. Through experiments like Rob’s we can learn more about the causes of these seemingly incurable health conditions and find dietary and nutritional methods for healing or mitigating them. Experiments in lab mice are important, but the mice don’t tell us what they’re experiencing! Rob lost 22 pounds during his 30-day fast, equivalent to 2200 calories per day if taken equally from protein and fat. Such an extended loss of lean tissue can be quite dangerous. If he had taken coconut oil or medium chain triglycerides during his fast, he would have conserved lean tissue mass and might have actually increasing ketone availability. Fortunately it looks like ketogenic dieting is the key to Rob’s migraine relief, so extreme fasting should not be necessary. Fasting does have therapeutic actions apart from its elevation of ketones. For instance, it promotes autophagy. It is possible that the fasting, not the ketones, was responsible for Rob’s cure of his varicose vein and teary eyes. Rob might wish to experiment with protein restriction and other techniques for autophagy promotion, in order to see if they might also be beneficial in addition to ketosis. Also, experimenting with micronutrients is important. Magnesium and riboflavin are often helpful for migraines. Good luck Rob! Keep us posted.